April 25th, 2008 : Sunny and warm, Water Temp 72* and Clear. Picked clients up today at 5am to get an early start. I caught bait yesterday so we could be fishing at first light and take advantage of the early bite. Set up with a spread of 10 Planner boards , a bobber and a couple of downlines and pulled main lake flats in 10 to 25 feet of water. It didn't take long for the action to begin and once it did it was non stop for 3 hours till we ran out of bait. We decided to go catch more bait and left the area , buzzards had found us and were circling in for the kill and we thought once we leave, they would . Caught 50 more baits and came back and set up on the same area. By now the boat traffic was heavy but the fisherman were gone so we could work where we wanted to unmolested. The fish still cooperated and by 1:30 we called it quits and went back to the marina to get some pictures. 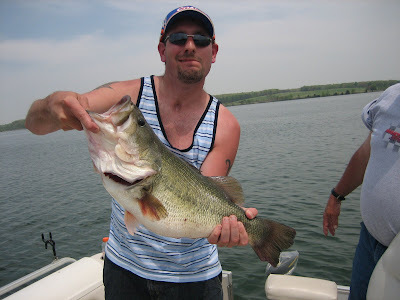 Matt caught a beautiful citation Bass weighing well over 8 pounds that had already spawned. He got a citation for the Bass and released the fish to be caught again. 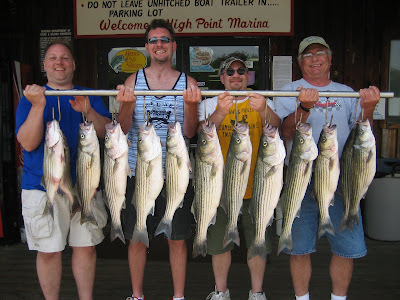 This morning we had 40 strikes, clients keeping 13 Stripers to take home with a lot of memories. The water Temp has risen 10 degrees in a week and this lake has turned on!